Here at Forever Lazy, we have always said that the main driving force of our success has always been our loyal customers and fans. They help to spread the word of laziness to everyone that they know, which in turn helps to increase our sales and keep us going forward. Therefore, we have been hard at work trying to figure out the best way to reward all those that have helped us to grow; the result being our new Refer-a-Friend Program. All you have to do is type in your friends’ names and email addresses and our system will send them an invitation to check out Forever Lazy. They will also receive a $5 off coupon in this email. Then, when one or more of your friends uses that $5 off coupon to make a purchase, we will credit your account $15 Lazy Dollars (store credits) the next day. There is no limit to how many people you can refer or how many credits that you can earn, so if you know a bunch of lazy people who enjoy being comfortable, you can build a lazy and comfortable wardrobe for free! Then, just login to your account and add to your cart the item(s) that you want. When you are going through the checkout process, you will see a payment option that will allow you to apply your available “Lazy Dollars” to your purchase. Also, the first person to reach 10 referred friends will get a $50 gift certificate to Best Buy!! *Note: Shipping charges are not covered because those charges are calculated through our shipping companies separately from our store. Quest for Awesome Customer Service Takes Dave to San Francisco! We always talk about how Awesome our Customer Service is and last week I got a chance to really practice what we preach. Last month, we got a ton of great publicity and the sales were fantastic! Therefore, most of our Uni-Lazies went into “backorder mode” with an expected wait time of 2-3 weeks until we would be able to ship them out. For those that ordered their Uni-Lazies with embroidery, that added on one more week. Well, our manufacturer was working as fast as he could to ship our product to us, however there were many people whose orders still hadn’t been filled. We were approaching the 3 week period that we promised and the only way to hit that deadline was for one of us to fly out to San Francisco to drop ship the Uni-Lazies ourselves. There were Uni-Lazies coming off the line at the end of the day last Thursday that wouldn’t have shipped to us until Friday… even if we overnighted them to ourselves in Wisconsin, they still wouldn’t get here until Monday at the earliest. We couldn’t let one more weekend go by! So, last Wednesday afternoon, I booked an early morning flight out to San Francisco for the very next (Thursday) morning. I brought all the shipping labels with me so that I could drop ship everything right from our manufacturer’s shop. I also brought a suitcase to fill with Uni-Lazies that needed to come back with me for embroidery. It was a success! 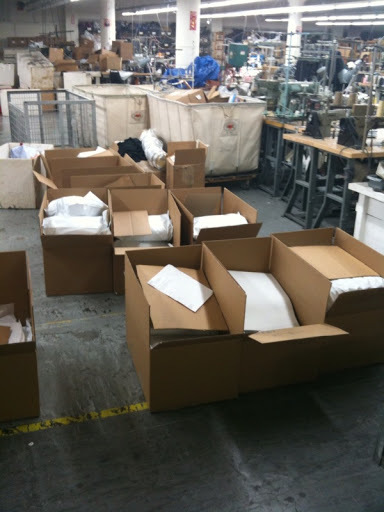 I shipped everything that I could and brought back a suitcase full of Uni-Lazies that needed embroidery. Another bonus of going out to personally visit with our manufacturer was to start working on a Children’s size pattern. We have gotten a LOT of requests and when our customers want something… we listen! We also looked into plus sizes as well and should have both Children’s and Plus Sizes ready for our big Fall push. We will have to go through the process of sending samples back and forth and creating size charts and all that fun stuff first. However, we know that the work will be worth it! Naturally, I wore the Uni-Lazy for my flight out to San Francisco. However, airport security flagged me as a security risk and ran me through all of the personal frisking… and not even by a good looking female security member. It turned out to be my ham sandwich that I had in my side pocket that raised the suspicion. They said my garment was so baggy that I could have been concealing something… like a ham sandwich. The bottom line here is that we are just as committed to our customers now as we always have been. Anything you guys need, you let us know and we’ll get it done!